CDP is not currently offering classes and performances. Discover Where We're Drumming From, Live! 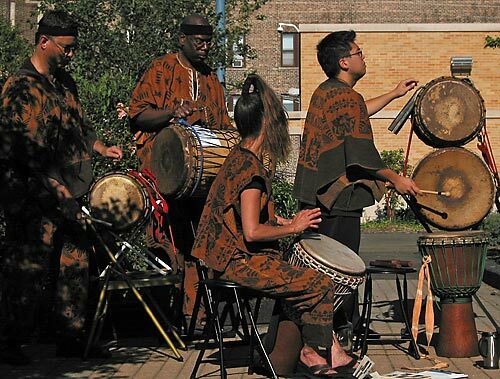 The Chicago Djembe Project Ensemble, one of Chicago's top traditional djembe groups, performs the intricate, melodic, energetic percussion music of the Malinke people of Guinea, West Africa. You'll love their performances! Artistic Director Lilian Friedberg is an outstanding Djembe Soloist who has studied and performed with the masters of her instrument on stages in Europe, Africa and North America for over 16 years. Co-Leader Jim Banks is Famoudou Konaté's "official Sangbanfola" in the U.S. The CDP Ensemble can bring you full-length concerts or shorter sets. We perform in nightclubs, concert venues, schools, institutions, for community groups and at private functions. Contact us to book a performance. Past and current contents of this site ©1999-20012 the Chicago Djembe Project. May not be re-used or reprinted in any form without permission.